This page leads to the main databases of the website. Fundamental information on models of holiness featured in the website - including names, affiliations, birth and death data, status of beatification causes, addresses of actors, - can be found at this page. To obtain these data, click the hyperlinks on the left hand side marked Years, Group Martyrs, Ceremonies, and Countries. Entries for each individual model of holiness are listed either according to years of death (click Years) or, in case the individual is part of a collective beatification cause for a group of martyrs, group association (click Group Martyrs). These data were drawn from the Index ac Status Causarum [1941; 1953; 1962; 1975; 1985; 1988; 1999; 2008], Attività della Santa Sede [1943-present], Acta Sanctae Sedis [1865-1906], Acta Pontificia [1906-08], Acta Apostolicae Sedis [1909-present], Bibliotheca Sanctorum [1961-70; 1987; 2000], Martyrologium Romanum , Dizionario degli Istituti di Perfezione [1974-2003], regular updates transmitted by the Congregation for the Causes of Saints (CCS), and information sent by the petitioners of beatification and canonization causes. In the case of a martyrdom which has not been formally recognized by the Congregation for the Causes of Saints (CCS), the phrase uti fertur (Lat., “so it is said”) is further added. The second entry refers to the given name of a model of holiness. The given names are never Anglicized, always spelled in their original forms and include diacritical marks when these apply. Extended Latin letters (e.g., the Polish ł, the Hungarian ő, etc.) in the original spelling of names are retained. Quoc ngu is used in the case of Vietnamese names. There are, however, entries whose names were originally spelled in a non-Roman writing system such as Armenian, Arabic, Ukrainian, Korean, etc. These names are Romanized according to the systems used by the Working Group on Romanization Systems of the United Nations Group of Experts on Geographical Names (UNGEGN). In many cases, one would encounter (as in the example above) two names: one unenclosed and the other enclosed in parentheses. The first is his/her civil name; the latter, the religious name given him/her upon joining a religious congregation. The devotional name attached to the religious name is Anglicized. In certain cases a name enclosed in brackets would be placed with the given name/s. This signifies either (1) a sobriquet by which the individual is better known, or (2) the civil name of a missionary in the place of his/her birth. The third entry refers to (1) the individual's canonical state of life and (2) the diocese or religious community to which the model of holiness is affiliated. Many of these religious community have an official English name. In cases where this does not exist, a non-official (n.o.) Anglicized name is supplied. The fourth entry gives the date and place of birth. competent diocese refers to the diocese or eparchy which constitutes the . protocol number signifies the number which the CCS has assigned to the cause for its official correspondences; if none is given, it means that the CCS has not officially issued one or made it public. type of cause identifies whether the cause concerns the question of the practice of heroic virtues or martyrdom; in rare cases, it concerns the Vatican’s confirmation of cultus, i.e. a long-standing public devotion given to a perceived holy woman or man who (in most cases) lived before the beginning of the modern era. in case vital witnesses reside outside the jurisdiction of the competent bishop, a rogatory inquiry would take place in the diocese where they reside so that their testimonies could be gathered. 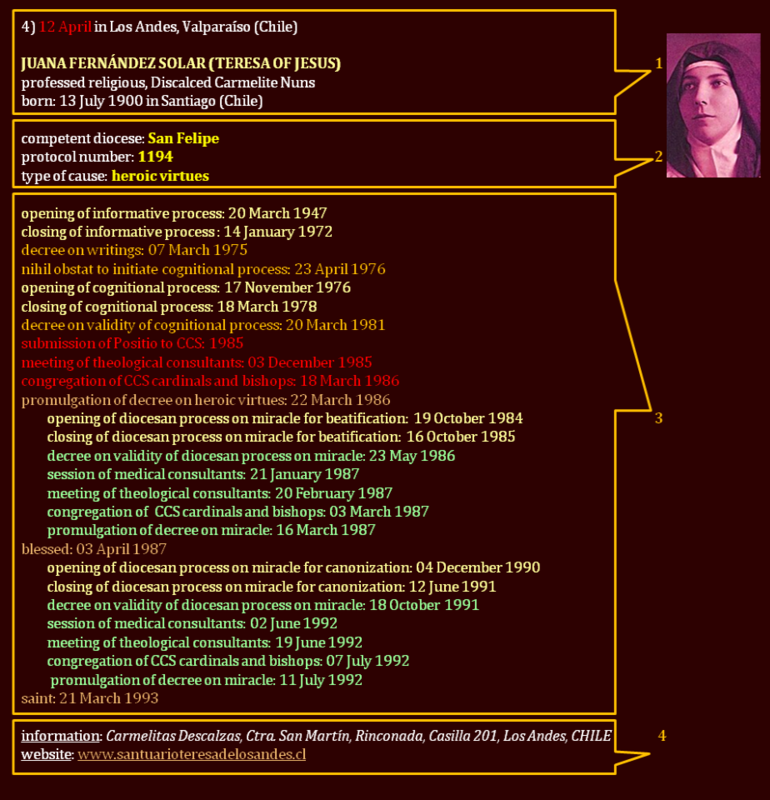 dates of the promulgation of a decree on heroic virtues or martyrdom (venerable), beatification (blessed), and canonization (saint). when available, the official website of the cause. If the cause has reached its conclusion through canonization, the names of the postulator and petitioner are dropped. In their lieu is indicated an address where one can obtain more information concerning the saint. Please note that without a formal permission from the Hagiography Circle the lists may not be published in a book, journal, or the like that is intended to be sold commercially. As in any product of an intellectual enterprise, International Copyright Law protects these lists. Their unauthorized publication, in part or in whole, is a violation of this law and the moral rights of the copyright owner. For all requests for permission to publish partly or wholly the lists, please contact our general coordinator at our Feedback page.